Player registration begins Sunday at 8:00 AM and will close at 9:30 AM. This will be strictly enforced. Tournament will start shortly after eligible players are registered. If I’ve never been to a Regional Qualifier tournament, what should I expect? I would like to provide feedback to KDE concerning the Regional I attended, who should I contact? If I qualified in a Dragon Duel tournament (for Duelists born 2005 or later) can I play in the regular World Championship Qualifier? Will Regional Qualifier invites “pass down” if someone who has already earned an invite earns another one? *The 2018 Regional Qualifier Season begins on August 2017 and extends until the summer of 2018. A list of dates and locations for currently scheduled Regional Qualifier events can be found online at http://www.yugioh-card.com/en/events/regionals_locations.html. New dates will be added to the calendar approximately every 3 months. The cost of the tournament is $20.00 USD in the United States, and $25.00 CAD in Canada. With your entry fee, you will receive five (5) booster packs of the latest Yu-Gi-Oh! TRADING CARD GAME booster set. At the Tournament Organizer’s discretion, the above prizes may be supplemented with additional Yu-Gi-Oh! TCG product or accessories. Invites to the 2018 World Championship Qualifier, depending upon the total registration of the event. 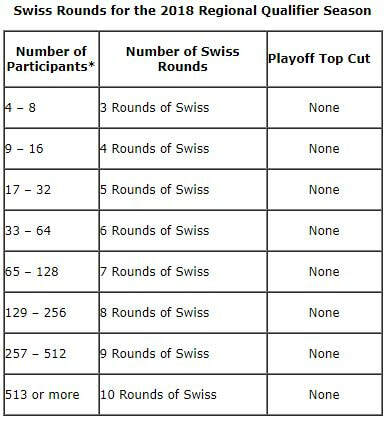 Invites to the 2018 World Championship Qualifier tournaments are awarded after the final round of Swiss. 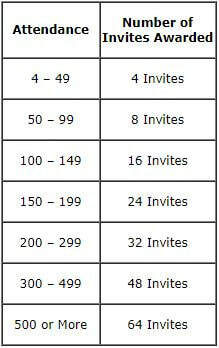 Invites are awarded to the first place finisher and extend down to the specified number of places based on attendance. If a Duelist who has already received an invitation to their 2018 World Championship Qualifier earns an additional invitation at a Regional Qualifier, the invite does not pass down. Duelists who already have an invite who earn additional invites are still required to complete an invite form each time they qualify. Duelists who earn invites will be responsible for completing the 2018 WCQ Invite form on-site at the Regional Qualifier, in order to be placed on the Invite List. Incomplete information could prevent your invite from being verified by KDE, so please ensure that your information is complete, accurate and legible. Part of the requirement to earn an invite is to complete an invite form on-site. Failure to do so may result in an invite not being awarded. Tournament Organizers may choose to play a Top 8 Single-Elimination Bracket until the finals to declare a winner if they advertise it before the start of the event. These rounds are unsanctioned and must not affect Invites or any prizing provided by KDE. Duelists can download the official KDE Deck List at http://www.yugioh-card.com/en/events/forms/KDE_DeckList.pdf. This is an editable PDF, so you will be able to type the card names in this form, which should help as your Deck List needs to be legible and complete – write the name of each card in full, and write down how many copies you have in your Deck. Duelists are encouraged to complete their Deck List before arriving at the Tournament by using the downloadable KDE Deck List and typing out all of the necessary information in the editable fields on the form. Please check the “Products” page online at http://www.yugioh-card.com/en/products/ for an updated look at the legality dates of Yu-Gi-Oh! TRADING CARD GAME product releases, prior to preparing your Deck for the event. Also check this link for the current legality of all promotional cards http://www.yugioh-card.com/en/gameplay/cardlegality.html. If a card’s surface decoration renders the card unrecognizable at first glance, then the card is not allowed for tournament play. Duelists who have been suspended from Organized Play by KDE are not considered to be in good standing, and may not register for or compete in Sanctioned or Official events. A list of suspended players can be found at http://www.yugioh-card.com/en/events/suspended.html. If a Suspended Duelist’s name appears on the Suspended Player list, they are not allowed to be on the premises, even if they have reached their date of eligibility for reinstatement. Suspended Duelists are required to apply for reinstatement with the KDE Penalty Committee via us-penalty@konami.com. Once their applications have been reviewed, and their reinstatement accepted, their name will be removed from the list. Until that time, they are considered to be Suspended Players. You should bring a tournament-legal Deck as described above, along with any tournament supplies you will need, such as paper and pen to track Life Points, dice or counters if you are using cards which require them, extra sleeves to replace any that become damaged, and so forth. If you have a CARD GAME ID number, you should bring your number. You’ll also need the entry fee for the tournament, as well as money for your incidentals (food, drink, Public Events, etc.). Attendees may not bring any items into the tournament venue that are prohibited by law in their area (local, state, or federal). In addition, unlawful items/transactions, weapons of any kind, and substance drugs which may be illegal on a local, state, and/or federal level, are not allowed at Sanctioned/Official events. Attendees who bring any such items to a tournament venue will incur penalties, including Disqualification and removal from the event, and risk suspension from KDE Organized Play. Tournament Organizers are required to keep lost and found items for at least 60 days after the conclusion of the Regional Qualifier. Duelists who lost items should seek the Lost & Found on-site. If the item is not found on-site, Duelists are encouraged to contact the Tournament Organizer within the 60-day period on the chance the lost item has been turned in. Tournament Organizer information can be found on the Regional Qualifier Regional Listings page found at http://www.yugioh-card.com/en/events/regionals_locations.html. Duelist wishing to register for a Regional Qualifier will be required to complete a registration form at the event. Duelists will be required to present their CARD GAME ID number along with a form of ID in order to register for the event. Acceptable forms of ID include current-year School ID cards, driver’s licenses, passports, or other government-issued identification documents. Duelists who register or attempt to register under another Duelist’s name or CARD GAME ID number will be disqualified from the event, and risk suspension from KDE Organized Play events. Duelists are required to register with their legal name, as it appears on their form of ID. Nicknames may not be used when registering for a Regional Qualifier. Initials to replace the First or Last Names may not be used when registering for a Regional Qualifier. Q: If I’ve never been to a Regional Qualifier tournament, what should I expect? You’ll have a better time at the event if you don’t have too many bulky or heavy possessions to carry around, as it can get crowded there on the floor. Think ahead while you are planning what to bring with you. You will also need a CARD GAME ID number – this is the ID number used to track you in the tournament. If you don’t already have one, you will be able to get one at the tournament. If you have a CARD GAME ID and have lost or forgotten it, you can ask the Registration station to look it up for you. If you’ve played in a previous event, they may be able to retrieve your number. Venues are selected to be able to accommodate at least 10% more than the average attendance in the Region or 10% more than the last attendance for an event held in the Region, whichever number is greater, but on very rare occasions, some venues may not be able to accommodate the actual turnout. It is recommended to arrive and register in a timely manner, especially if you are travelling to attend the event. If you have any questions, do not hesitate to contact the Tournament Organizer via the contact information provided at the Regional Locator page (http://www.yugioh-card.com/en/events/regionals_locations.html). When you compete in a Regional Qualifier tournament, you’ll be held to high standards of play and sportsmanship. You should know how the cards in your Deck work, and should take great care to prepare your Deck, sleeves, and Deck List. Duelists must pay attention to information from judges and/or tournament staff in order to understand what is going on. Duelists are expected to know and understand the information provided in the above policies and guidelines while at a Regional Qualifier or any Sanctioned event. In order to judge at a Regional Qualifier, judges must be registered in the KDE Judge Program. Judges must first pass the online Level 1 Rulings Comprehension test available at http://www.yugioh-card.com/en/judges/index.html. Following their successful completion of the test, they must then follow the instructions in their confirmation e-mail, and send in a completed application to join the KDE Judge Program. All judges are required to hold Level 1 Rulings Comprehension certification and be enrolled in the KDE Judge Program in order to be eligible to judge at a Regional Qualifier. If you’re interested in judging, you should contact the Tournament Organizer for the Regional Qualifier as soon as possible (use the contact number provided in the Regional Locator listing). Most Tournament Organizers are always on the lookout for Judge Staff, so be prepared to provide your full name, contact information, including e-mail and phone number, and a description of your previous judging experience. Vending space is generally available at Regional Qualifiers held outside of Official Tournament Stores, and is open to Official Tournament Stores in good standing. Vendors must meet certain requirements and agree to abide by set guidelines. Interested vendors should e-mail us-opsupport@konami.com with the header “Request to Vend at [name and location of Regional Qualifier]”. All vending applications must be submitted to KDE by no later than three (3) weeks prior to the scheduled event. Your best resource for answers about a specific Regional Qualifier event is the contact number listed on the Regional Locator. KDE won’t be able to answer questions such as “How do I get to the venue?,” “Where should I park?,” “When does registration start?,” and so forth. For questions such as these, you will need to contact the Tournament Organizer directly. If you have more general questions about Regional Qualifiers, you can send them to us-opsupport@konami.com. Please be as detailed as possible, so we can try to provide you with the answers you’re seeking! Dragon Duel tournaments are exclusive to Duelists born before a certain calendar year, with the calendar year requirement moving forward after the World Championship each year. The current year requirement is for Duelists born on 2005 or later. The Top 4 Duelists in a Dragon Duel tournament or their guardian must fill out a copy the 2018 WCQ Invite Form prior to receiving their prizes. A valid e-mail address must be provided for either the Duelist or the guardian. Please check the Regional Qualifier listing page at http://www.yugioh-card.com/en/events/regionals_locations.html to see if the Regional Qualifier is scheduled to host a Dragon Duel tournament. If less than four (4) Dragon Duel eligible Duelists register for the Dragon Duel, all eligible Duelists who have registered for the event will still win a Dragon Duel shirt as a prize. In addition, please check with the onsite Tournament Organizer as you may be eligible to enter one of the other Public Events being held at the Regional Qualifier at no cost. Please note that the Regional Game Mat and the WCQ Invites are only awarded if the event is successfully run. For additional information regarding the Ultimate Duelist Series, please go to http://www.yugioh-card.com/en/ultimateduelist/. Sometimes a Match will not be finished when the time ends for a round. If this happens, the Duelist should note whose turn it is when time is called, and raise their hands for a judge. The judge should be notified that the Match is ongoing and whose turn it is. The judge may or may not stay to supervise the End of Match procedure, but should ensure that both Duelists understand the following procedure. Regional Qualifiers and Dragon Duel Tournaments are Tier 2 Events. All Public Events (except for Dragon Duel) held during a Regional Qualifier are Tier 1 Events. Q: I would like to provide feedback to KDE concerning the Regional I attended, who should I contact? If you attended one of our Regional Qualifiers and would like to send us feedback, you can send us an e-mail about your specific event by clicking on the Feedback link located beside the event listing corresponding to the Regional Qualifier you attended. You can find the list of Regional Qualifiers at http://www.yugioh-card.com/en/events/regionals_locations.html. All feedback, including comments about the organizer, the judges, or the event itself, will be welcome! All feedback is always kept confidential. Please make sure your e-mail includes which Regional you attended, including date and location. Q: If I qualified in a Dragon Duel tournament (for Duelists born 2005 or later) can I play in the regular World Championship Qualifier? Duelists who were born 2005 or later may choose to play in the Dragon Duel World Championship Qualifier or the World Championship Qualifier that is held for all ages in their Region. They may not participate in both events. Q: Will Regional Qualifier invites “pass down” if someone who has already earned an invite earns another one? No, invites will not pass down for the 2018 Regional Qualifier season. A list of Duelists who have earned invites to a World Championship Qualifier is posted online. You can find the list here: http://www.yugioh-card.com/en/events/wcq_invite_list.html. A list of Duelists who have earned invites to the Dragon Duel World Championship Qualifier is posted online. You can find the list here: http://www.yugioh-card.com/en/events/wcq_invite_list.html. Please remember that invite status information isn’t automatically or instantly updated, so you should allow approximately 2-8 weeks after the conclusion of your event for results to be posted from your tournament.